Reports say the IDF has now stepped into the battle for control over the Kuneitra and Daraa area along the Israeli-Syrian border- and more. We will probably witness a major war between Israel and the Iranian axis this year, Maj. Gen. Nitzan Alon, the commander of IDF Operations, said during an interview with Galatz, Israel’s Army Radio on Monday this week. “The year 2018 has the potential for escalation, not necessarily because either side wants to initiate it, but because of a gradual deterioration. This has led us to raise the level of preparedness,” according to Alon. He added that his assessment was based on what is currently happening in Syria where the Russian and Iranian-backed pro-Assad axis is in the process of eliminating the last pockets of resistance. Those opposition hubs, located in Idlib and eastern Ghouta, are where hundreds of Syrians have been killed in a ruthless offensive by Assad’s forces over the last week, and in east Syria where the Iranian axis seized the border town Abu Kamal this week after an extremely bloody battle. Alon said that Assad’s victory will free up Iran’s proxies in Syria and give them the possibility to prepare for war with Israel. “We are not allowing these things to happen without our involvement. We are acting and will continue to act,” the IDF operations commander warned. Alon’s rare interview with Israel's Army Radio Galatz came a day after Prime Minister Benyamin Netanyahu issued a similar warning during the annual security conference in Munich, Germany. Holding up a piece of what was left of an Iranian drone which was downed by the IAF on Saturday Februrary10, Netanyahu compared Iran’s aggressive imperialistic drive in the Middle East with the rise of Nazi Germany and called upon the world to take action against the Islamic Republic before it is too late. “Don’t test Israel’s resolve,” Netanyahu warned while he conveyed a clear message to Syrian dictator Bashar al-Assad not to allow further Iranian entrenchment in Syria. “If Mr. Assad invites Iran in militarily, that changes our position. So that is up to Iran and to Mr. Assad,” Netanyahu said in Munich. In fact, however, Israel has already changed its approach to the Syrian war and Iran’s belligerent activities in the ruined country. This not only became clear on February 10th when the IAF bombed twelve Iran-related targets in Syria in response to an incursion of an Iranian attack drone into Israeli airspace near Bet Shean, but also from a significant change in Israel’s ‘good neighbor’ policy toward the Syrian war. Up till now the central part of this policy has been providing medical and humanitarian aid to Syrians in the Kuneitra Province on the Syrian Golan Heights. Some 5,000 Syrians have been treated in Israeli hospitals in the Galilee and in the Rambam Medical Center in Haifa over the past few years, but recently the IDF shifted its focus toward military assistance to local Syrian rebel groups in an effort to keep the Iranian axis away from the Israeli border on the Golan Heights. Elizabeth Tzurkov a research associate at the Forum for Regional Thinking (FORTH) who is an expert on Syria and holds an MA in Middle East studies from Tel Aviv university, reported last week that the IDF has now stepped into the battle for control over the Kuneitra and Daraa area along the Israeli-Syrian border. This happened after the government in Jerusalem failed to enlist the United States and Russia for its efforts to curb the increasing Iranian threat to Israel from southwest Syria. Seven militias, among them Islamist rebel groups and the Free Syrian Army, receive direct military aid, according to Tzurkov who based her assessment on information obtained from numerous sources inside Syria. She also provided a link to a video depicting the delivery of Israeli weapons and ammunition to the Firqat Ahrar Nawa militia near Kuneitra in Syria at the end of 2017. Some of these groups previously received military aid from the U.S., but after the Trump Administration decided to halt all assistance to Sunni Arab militias fighting the Assad regime, Israel stepped in and began to deliver cash and weapons to the rebels. 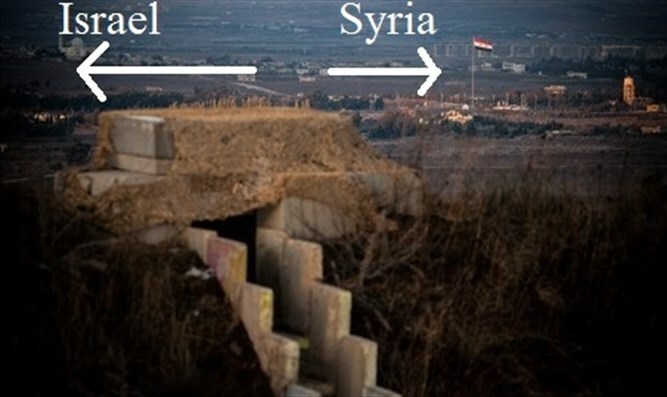 The Israeli proxies now try to prevent the Iranian axis from setting up camp in the border region on the Golan Heights but also fight Jaysh Khalid ibn al-Walid, the local ISIS branch which controls a pocket of territory adjacent to the southern Golan Heights and the Jordanian border opposite the Syrian Daraa Province. The IDF and IAF, furthermore, help the rebels with drone strikes and missile attacks on positions of Jaysh Khalid ibn al-Walid. They even allowed dozens of rebels to enter Israeli territory and cross into the Beit Jann region west of Damascus and opposite Mount Hermon in order to participate in a battle against Iranian proxies who tried to set up camp in the area at the end of 2017. The extension of Israel’s ‘good neighbor’ policy in Syria is solely directed at the Iranian attempt to transform the country into a client state from which territory Iran and its Shiite allies want to step up their belligerent activities against the Jewish state, according to Tzurkov. The news about Israel’s increasing involvement in the Syrian war coincided with a New York Times report mapping out scores of Iranian bases and other military installations in Syria. All of them are located in the western part of the warn-torn country. The reason for the increasing Iranian military activities in Syria is now preparation for a multi-front war against Israel, experts say. “The ultimate goal is, in the case of another war, to make Syria a new front between Israel, Hezbollah and Iran,” NYT quoted Iran expert Amir Toumaj, a research analyst at the Foundation for Defense of Democracies, as saying. The seriousness of the situation has been underlined by a recent statement of the Iranian general overseeing the Iran's preparations for a war with Israel. Qassem Soleimani, the commander of the Quds Force of the Iranian Revolutionary Guards Corps, repeated Iran’s vow to destroy Israel during a ceremony commemorating the tenth anniversary of the assassination of Imad Mugniyeh, Hezbollah’s former terror mastermind. Claiming that Mugniyeh’s death caused an “Islamic uprising” against Israel Soleimani vowed to punish the Jewish state by wiping it from the face of earth. Earlier, during a meeting with Hamas leader Saleh al-Arouri in October 2017, the Al Quds boss said Iran’s new priority was providing aid to the ‘Islamic Resistance’ meaning the loose coalition of Iranian-backed terror groups fighting Israel. His words were not merely rhetoric and should be taken seriously. The brilliant Iranian general, who has overseen and won virtually every major battle in Iraq and Syria in recent years, has now been tasked with preparations for war with Israel. Soleimani has been responsible for the built up of a large coalition of Shiite militias in Syria, Lebanon and Iraq, and was the man behind the recent reconciliation between Palestinian terror groups and Iran.